A 5-year-old serious privilege-escalation vulnerability has been discovered in Linux kernel that affects almost every distro of the Linux operating system, including Redhat, and Ubuntu. Over a month back, a nine-year-old privilege-escalation vulnerability, dubbed "Dirty COW," was discovered in the Linux kernel that affected every distro of the open-source operating system, including Red Hat, Debian, and Ubuntu. 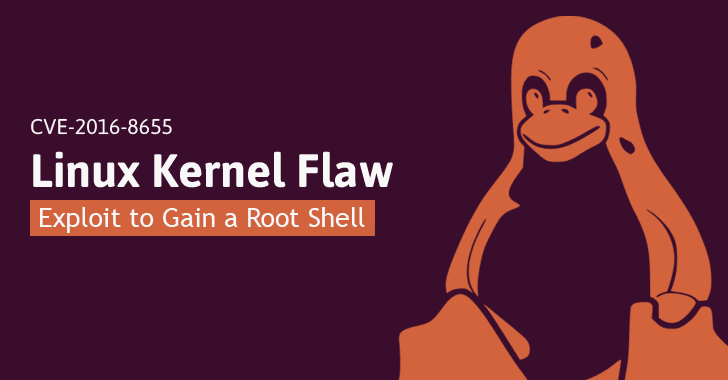 Now, another Linux kernel vulnerability (CVE-2016-8655) that dates back to 2011 disclosed today could allow an unprivileged local user to gain root privileges by exploiting a race condition in the af_packet implementation in the Linux kernel. Philip Pettersson, the researcher who discovered the flaw, was able to create an exploit to gain a root shell on an Ubuntu 16.04 LTS system (Linux Kernel 4.4) and also defeated SMEP/SMAP (Supervisor Mode Execution Prevention/Supervisor Mode Access Prevention) protection to gain kernel code execution abilities. In other words, a local unprivileged attacker can use this exploit to cause a denial of service (crashing server) or run arbitrary malicious code with administrative privileges on the targeted system. "A race condition issue leading to a use-after-free flaw was found in the way the raw packet sockets implementation in the Linux kernel networking subsystem handled synchronization while creating the TPACKET_V3 ring buffer," Red Hat security advisory explains. "A local user able to open a raw packet socket (requires the CAP_NET_RAW capability) could use this flaw to elevate their privileges on the system." This threat creates a potential danger for service providers to have their servers crashed or hacked through this Linux kernel vulnerability. "On Android, processes with gid=3004/AID_NET_RAW are able to create AF_PACKET sockets (mediaserver) and can trigger the bug," Pettersson explains. The vulnerability was patched in the mainline kernel last week, so users are advised to update their Linux distro as soon as possible.